Books I read recently, don’t have a ton to say about, but wanted to mention. Romantic British chick lit, featuring an archaeologist heroine who starts seeing ghosts and the former rock star who wrote a Christmas hit about their brief meeting years before (and his ghostly brother, who wants to reunite them). I first saw this in the “Hidden Gems” column at All About Romance (I love lists of books people think deserved more attention). Then Jayne reviewed it at Dear Author; she reads more romantic women’s fiction/chick lit type books than I do, and I find her taste a reliable guide when I’m in the mood for something light and sweet and charming like this. In the best tradition of chick lit fluff, it also managed to say some serious and moving things about grief, loss, and coming to terms with the past (often a theme of ghost stories). I found Ellie’s friendship with Alex the ghost more developed–and more interesting–than her romance with Rafe. Rafe’s drinking problem sometimes gets depicted as alcoholism and sometimes as something more transient; either way, it was too easily resolved, and a silly Big Misunderstanding took the space that could have been occupied by a more serious conflict. But the book was charming and engaging and just what I was in the mood for when I read it. I requested this from the online library largely on the basis of the cover, and because I’d enjoyed listening to her non-fiction book The Invention of Murder. The I read this glowing review. I didn’t like it quite that much, but it was a lot of fun. Robert Galbraith’s mystery The Silkworm is a dark and slimy satire of publishing; this is a frothier cousin. I really enjoyed Sam, the 40ish heroine, who has something of the self-deprecating chick lit protagonist about her, but more self confidence. There’s a romance thread, too. I hope we’re going to see more of these characters. I’m up to book 11 of 12 now. I think the three “Autumn” volumes covering the WWII years are going to end up being my favorites, if one can have favorite individual volumes in this series, which really only achieves its effects as a series. It’s in these volumes that Powell’s technique really paid off. The war is in some ways at a distance: Nick joins the army but isn’t at the front. For most of the war he’s a liaison to various allied armies in exile (Polish, Belgian, Czech). So the focus is still mainly on social life and relationships, meetings and parties. But there are also a lot of losses, and because we have watched these characters wander in and out of Nick’s life for years, their deaths matter; I mourned the fact that they would never return to these pages. Powell doesn’t describe deep emotion, but he nevertheless conveys it. I expect I will be revisiting this series, both in print and audio. I had this from the library, and the downside of that was that it would repay dipping in to, with time between readings to meditate on the short intense pieces, most describing everyday microaggressions. I didn’t have time to read it that way, and so couldn’t fully engage with all of it. But I still found it a very powerful book, giving concrete illustrations of what was largely an abstract concept to me. One thing lyrical poetry does well is convey intensity of feeling and experience. Rankine shows what microaggressions feel like. I found Dan Chiasson’s New Yorker review helpful for providing some literary context for Rankine’s work. Most of my reading over the last couple of months came from the library, not my TBR, though I intended the reverse to be true. I’m still working on shifting the balance. I read a lot of good books, but I also felt pressure to get through them which diminished my enjoyment. I think part of my library hold habit is TBR avoidance. It’s too overwhelming. But if I were reading more from it, I’d feel better about my book-buying habits. I’ll just have to try again. After I read those three library holds that just came in. 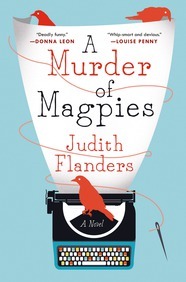 This entry was posted in chicklit, fiction, mystery, non-fiction, review and tagged A Dance to the Music of Time, A Murder of Magpies, Anthony Powell, Citizen, Claudia Rankine, Dead Romantic, Judith Flanders, Ruth Saberton. Bookmark the permalink. For older books in my tbr, I go in with this attitude: I need to clear you out. I’m going to give you one chapter and if I don’t want to continue, I delete. Thus decreasing my tbr pile and making myself feel good. I’m also one of those people who gets stressed by a too-numerous tbr pile, so it’s in my interest to cull. That all said, I lean on library loans a lot for my reading as well. I need to do this, too. A lot of the books deep in my TBR are romances I bought before I had a really good sense of my taste. (E.g. I don’t like most PNR). So I probably no longer want to read many of them. I have to sample and then let them go. I’ll never get to read them all. Many of these are on an external hard drive, but not on my ereader. So I’m not really pretending I’m about to read them. But I haven’t quite admitted I never will, either, so they still nag at me. First world problem! On the plus side, I’ve been reading some things from the library that stretch my tastes and that I probably wouldn’t have bought, and that’s been great. What I love about the library is I don’t have to think about whether I’ll _really_ like it or not. I can just take the book out, have a quick look, and be surprised by how I like it, or send it back. It does help me find new stuff. Like Liana Moriarty, who writes the kind of books I’d guess I wouldn’t like—and I would be wrong. I have noted Citizen: An American Lyric in my list to read. I found the New Yorker review fascinating. I just finished reading Brown Girl Dreaming by Woodson and it deals with race in the 1960s and 1970s. This is 21st C, so it seems like an ongoing conversation to have. I really want to read that, especially as it looks like I’ll be teaching children’s literature again next Fall. I’ll have a mini review in my April reading round-up. I loved it. Such beauty! I think it’s harder to write light and sweet without being saccharine than it is to write something angsty. It takes a delicate touch that not everyone has. A Murder of Magpies sounds good. Among other things, I like books that are sendups/critiques of a type of workplace. (This explains my love for mysteries (and other books) set in academia that also function as sendups.) The other book reviewed in the link you included sounds interesting also. So many books, so little time. Citizen is also going down on my list of books to read. As an Asian-American, I’ve received few microaggressions, but the times I was called ethnic slurs as a child by children I now realize may not have meant them hurtfully still sting. So does the fact that none of them were even accurate; I’m Korean-American, not a chink, a Jap, or a Commie. In law school, I witnessed a Puerto Rican classmate get called out for being black by a carload of white folks, either via the n-word or being told to go back to Africa. Prejudice is not only hateful, it’s ignorant. If I still feel the sting of the few racial and ethnic slurs hurled at me half a century ago, I can’t imagine what it must be like for Black folks who hear such slurs (and worse) all the time, who are assumed to be stupid, lazy, and criminal. I agree. I don’t want cotton candy, and I thought this had just enough reality in the way it looked at grief to keep it from being saccharine/fake, even though it was very fairytale, especially in the romance (and, you know the ghosts, who also help Ellie deal with a work conflict). I wouldn’t want a steady diet of stories like that but every once in a while I want something undemanding but not, well, stupid–or pointless, I guess I mean. I like the mystery reviews at Open Letters Monthly. I haven’t liked all the books I’ve tried on her recommendation, but they’re thoughtful reviews of interesting books. It’s a taste issue, not a quality issue, when they don’t work for me. I think all women experience the occasional microaggression, though I feel lucky it hasn’t happened to me that often–and I would never compare them in frequency or pain to racist microaggressions. One thing I found really helpful in reading this book is that I understood that term better. I knew what they were, of course, and I knew they existed, but I wondered about “aggression” when often they are unintentional (though not always) rather than deliberate. What Rankine helped me see is that the intention doesn’t matter but the fact that they are felt as aggressions. And for good reason.